“What if the baby birds are extra soft and downy? Is it ok to touch them then?” I joked. There was a lot of talk about petting tame baby birds as Brian and I motored through the night to reach Isla Isabel. Our guidebook showed photos of white, fluffy baby birds and said the birds had no fear of humans. 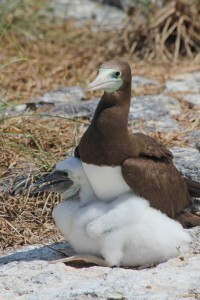 Many varieties of Boobies and Frigate Birds nest on Isla Isabel but we didn’t know if it would be the right time of the year to see babies. We arrived at the small island, anchored Magic near two other boats, and went ashore. We landed our dinghy on a small beach near a group of metal sheds. Mexican fishing boats lined the beach and some of the fishermen were moving nets from boats to sheds, pausing to offer us a friendly smile. Hundreds of birds of various sizes swirled excitedly around an open shed door, looking for scraps. We walked up the beach and found a tall, metal sign describing the trails on the island. A half dozen Frigate Birds lounged atop the sign, with three foot long bodies, curved beaks and deep black, alien eyes. They merely turned their heads lazily toward us as we stopped to read the sign. A crumbled concrete path led into a shady forest of stunted trees which grew to only about fifteen feet tall. The forest was filled with the enchanted cackling sounds of the Frigates. I squealed as I began to see nests and fluffy babies in the treetops. These were big babies! The baby Frigates were about a foot tall, with downy white and brown feathers. They always huddled next to either mom or dad in their nests. Captivated by the babies in the treetops, I jumped as leaves rustled near my feet. A small iguana sprinted away into the trees. 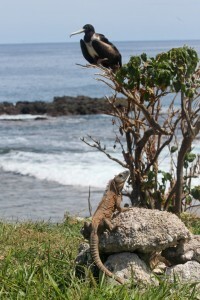 As we continued on the primitive path, we saw at least a hundred iguanas in the small, enchanted Frigate Bird forest. Most were around 10 inches long including their tail, but we also found several larger specimens up to three feet in length! Anyone who doesn’t like lizards would find a nightmarish scenario on this island. Iguanas and other lizards were everywhere and blended well into the grass and leaves. They would constantly run out from under our feet as we walked. We never got used to this, and we would giggle and jump each time. 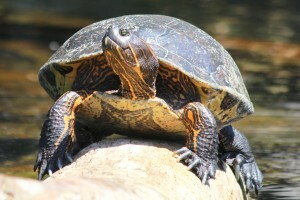 They were mellow and non-confrontational, and mostly just wanted to bask on rocks in the sun. They were great photo subjects and kept us from gazing up at the treetops the whole time. There was also plenty to see on the ground. 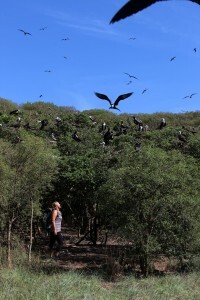 We walked through the enchanted Frigate Bird forest and then followed the trail up a steep, grassy hill. Brian was in front and was the first to see the baby bird in the grass. “There’s a baby bird right here on the trail!” Brian called out with excitement. 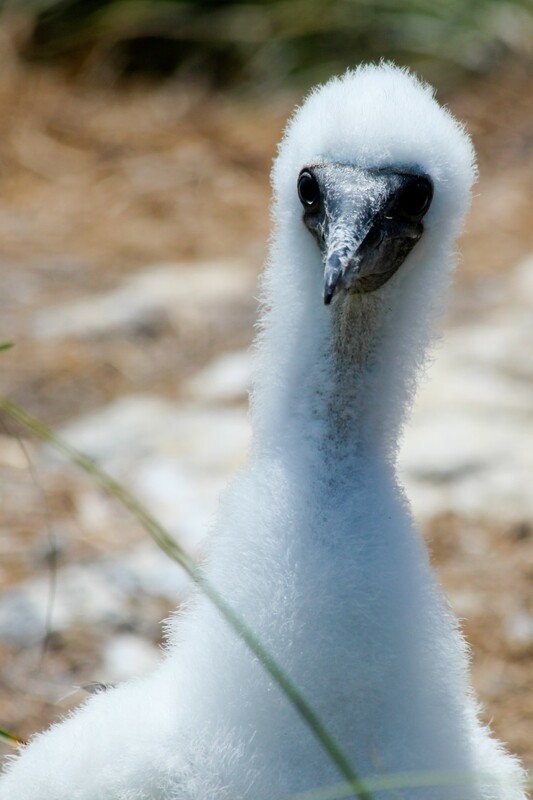 I rushed up to him and indeed, there was a single white and brown Frigate chick in the middle of the trail. It stood calmly among large mounds of green grass. Its parents did not appear to be anywhere nearby. It seemed very tame and didn’t even flinch as I approached. I got within just a few feet, and then lay on the ground next to the baby bird. It let out a gentle cackle as I settled down next to it. The baby was so wild and fearless. It trusted everything it came into contact with, because it didn’t know otherwise. This was the perfect opportunity to pet a soft, friendly, baby bird with no parents around. But fulfilling that human fantasy just didn’t feel right on this sacred island, where the animals probably still live as they did a thousand years ago. We enjoyed the baby bird, and then continued up the path to the top of the hill. We found ocean views in every direction and over a hundred Boobies and Gulls nesting on the ground. More squeals of delight gushed out as I spotted several Boobie chicks. They were indeed the cutest chicks on the island. They were also big babies, about a foot tall, with bodies covered in fluffy, white down. Their inquisitive, innocent faces were precious. Even though they were almost as large as the parents, some parents still tried to sit on the chicks. Some roamed independently, making cute and clumsy progress across the uneven grass. We wandered slowly through a minefield of nests and birds on the hill, sometimes receiving a squawk when we passed too closely to a nesting Booby or Gull. Overall, we felt tolerated and accepted in the bird world (birld). We spent about an hour on the hill, making our acquaintance with the friendly birds and avoiding the squawking, nesting ones. 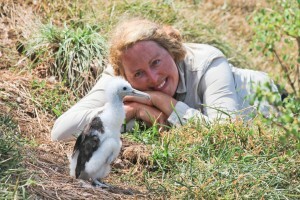 Many of the mature Boobies were quite curious and even seemed to enjoy having human visitors. I met an especially friendly one sitting on a tower that stared intently at me as I stared right back into its cute little face, only five feet away. This went on for at least two minutes. 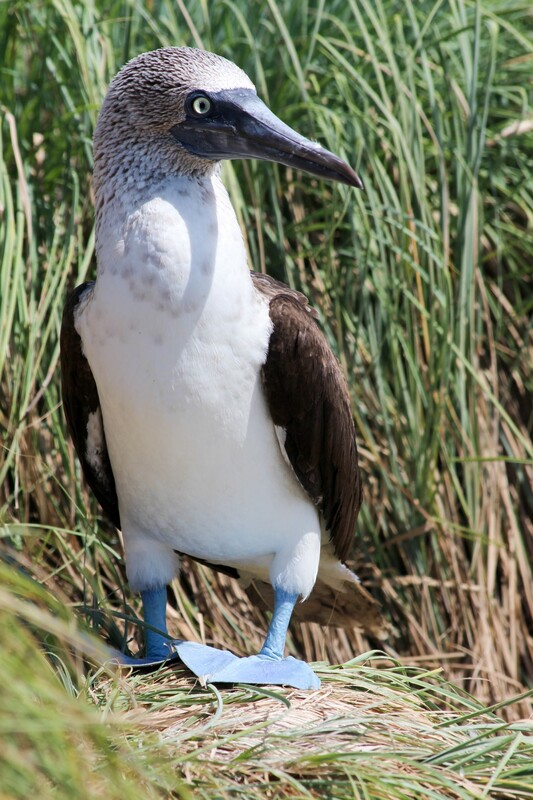 We saw two blue footed Boobies enjoying a strange mating ritual, where they lift their feet one at a time and shift their weight back and forth as they dance slowly for their partner. They shyly danced for each other near a cliff edge, with the deep blue pacific ocean in the background. Could anything be more romantic? The little exhibitionists glanced over at us periodically to see if we were still watching as they danced. The birds were the most exciting part of our visit, and the scuba diving at Isla Isabel was also wonderful. The water was warm and visibility was good for Pacific Mexico (around 30-40 feet). The underwater rock was different from other places we’ve been diving in Mexico. One dive featured shelf after shelf of different animals as we descended on a shallow wall, like a layer cake of exciting ocean creatures. 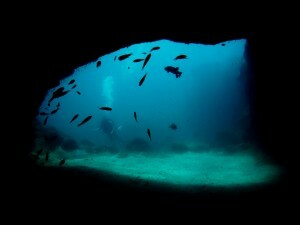 We found a small underwater cave and arch near Punta Bobos and had fun exploring the rocky features there. We saw many large fish, including a school of shiny, silver jacks. They always caught our eye and never allowed us to get close for photos. During our last dive at the island I even spotted my favorite eel hiding under a rock! A Zebra Moray is always an exciting find. 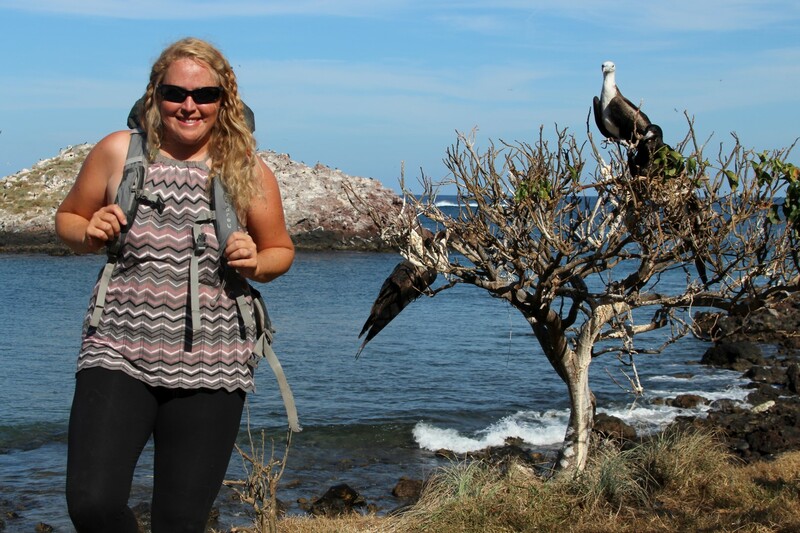 We took a longer hike all the way around the island just before leaving, and found birds and beautiful scenery everywhere. 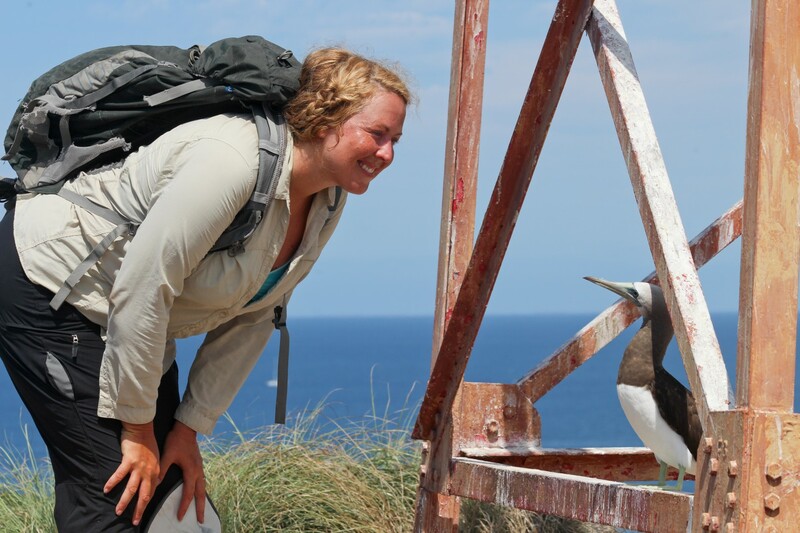 There is even a crater in the interior of the island surrounded by nesting Frigates. Isla Isabel is one of my favorite places on earth. This little paradise of friendly animals took me back to a more primitive time in the history of the world, when animals weren’t wary of us yet. It was very special to share their enchanted world for a few days and feel so accepted by them. 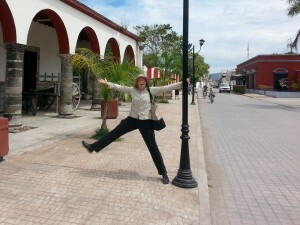 We love San Blas, a sleepy town between Mazatlan and Puerto Vallarta. Some say there isn’t much to do and the bugs are terrible, but we enjoyed a blissful two weeks there. The bliss began after we found a place to stay away from the bugs. We made the mistake of anchoring in a river estuary one fateful night, and the bugs were epic. No-see-ums called “jejenes” came right through our insect screens and feasted on us all night. It was too hot for a blanket, but any exposed body part would quickly become covered in pink polka dots from all the bites. Lesson learned. We left the estuary and found a spot at sea. A wild beach with crashing waves, palm trees and jungle became our backdrop when we moved to an anchorage near our favorite surfing spot, Matenchen Bay. We settled into a routine of working, surfing, relaxing and fervently scratching our bug bites. During the week we usually had all the waves to ourselves in the bay. On weekends, Mexican families came to picnic and swim while vendors roamed the beaches selling loaves of banana bread and mangoes carved into the shapes of tropical flowers. 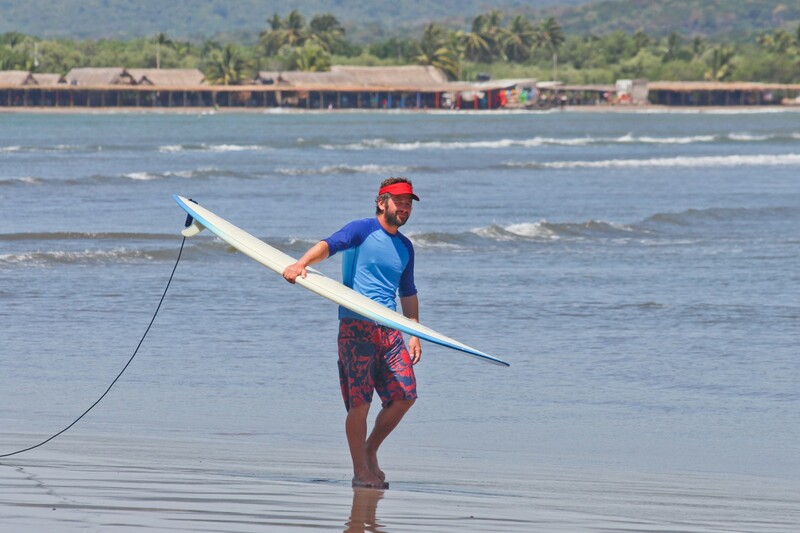 I learned to surf in San Blas. Brian already loves surfing and we have several boards on Magic. This winter I’ve been learning new ocean sports. I already learned how challenging and intimidating kiteboarding could be and I wondered if surfing would be just as difficult. The answer is no. Surfing was easier than kiteboarding, and much more relaxing. It felt meditative to float in the water and watch waves roll in endlessly across the Pacific. I kept my attention on the different sizes and shapes of the waves, watching them rise, build, and break as I waited in a wide, sandy bay. When the right sized wave would break near me, spilling its frothy top over onto itself, I would jump onto my board in front of the froth, paddle like mad with my hands, and then let the wave catch me and shoot me quickly across the surface of the sea. My own personal surf school consisted of relaxing and playing in the waves with Brian nearby to help or encourage. The time slipped by lazily day after day. No lessons, no pressure, no expectations. Brian taught me to ride the breaking waves on my belly and it felt exciting enough for awhile. Belly rides were great! Who needs to stand up on the board? This most basic version of belly surfing was all I did for the first ten days, as Brian skillfully surfed all sorts of big waves nearby. Then suddenly, one day, it happened! The belly rides were long and smooth that day. Without thinking much about it, I first knelt on the board and then stood up as the wave carried me to the beach. 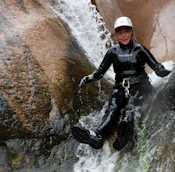 It was an exhilarating feeling to ride a wave standing up. My first dozen rides were stiff and awkward. There were some uncomfortable wipeouts. 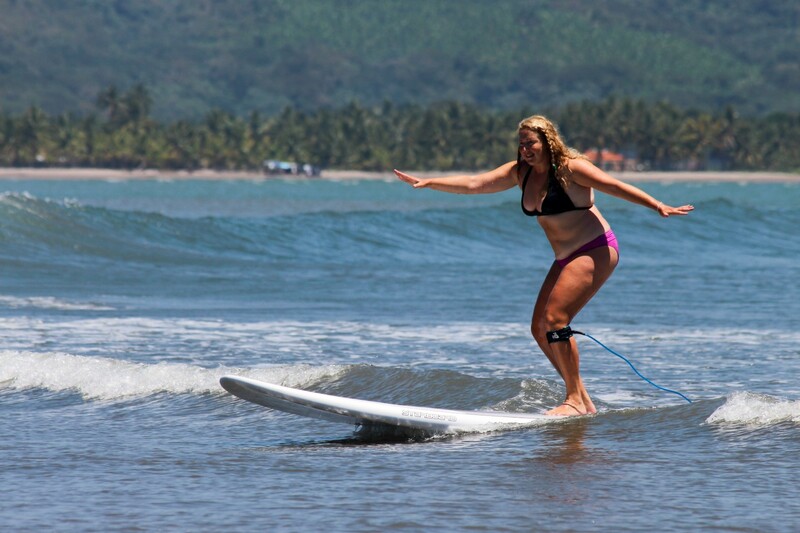 Then I started to practice different ways of standing on the board and riding the waves became easier. 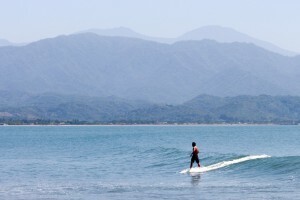 Matenchen Bay was surfing heaven and maybe I was spoiled having my first surfing experiences there. 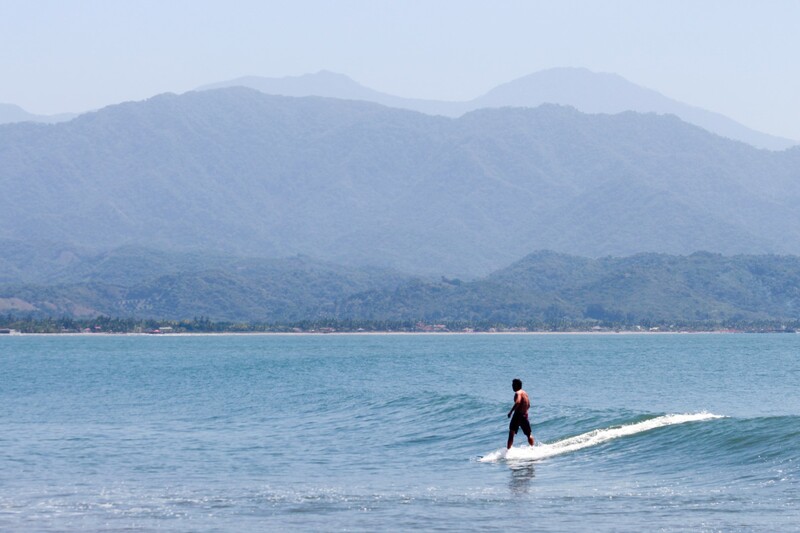 It might be hard to top this experience, with so little competition for waves, a beautiful bay with a sandy bottom and a great selection of different sizes of waves. Plus, fresh banana bread to snack on between sessions! Does it get any better? 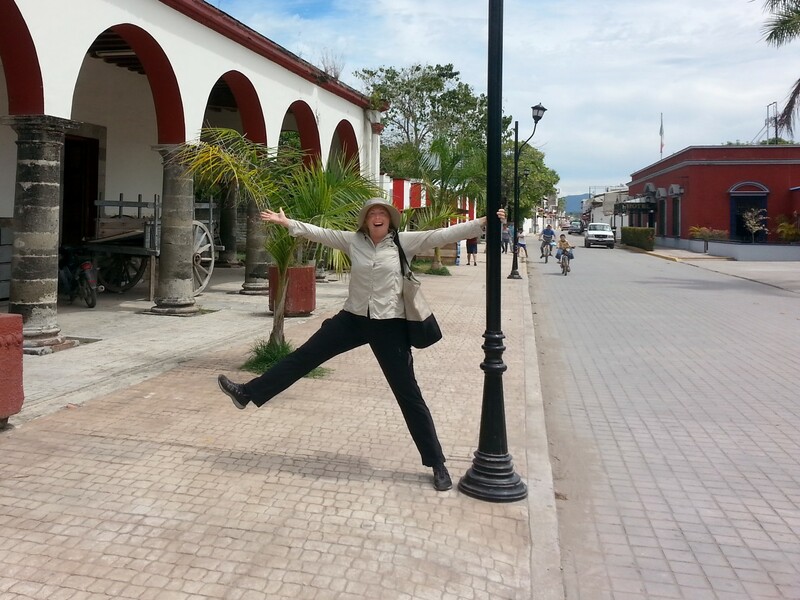 The small town of San Blas was incredible, too. People were very friendly, chain stores were nearly non-existent and we had some of the best shrimp I’ve ever had in my life. We met a great local couple on the street who quickly invited us to their home. We visited with them awhile and enjoyed some easy chatting since they spoke good English. We felt enveloped in their love and it was such a warm welcome to San Blas, which is the kind of place where a gringo can integrate easily into the community. I love places like this. We took a jungle tour near Matenchen Bay. We usually don’t enjoy tours, but this one was really worthwhile and not that costly. 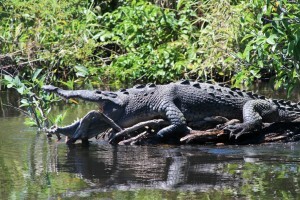 Wild crocodiles lounged by the side of the river as we enjoyed them from the comfort of a small powerboat. Some of them were so still, laying there with huge open mouths, they almost looked fake. 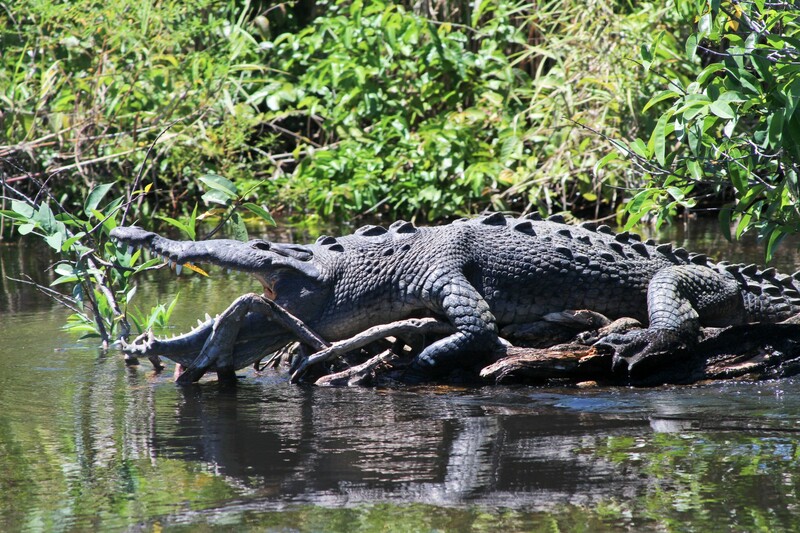 We visited a crocodile sanctuary as well as seeing them in the wild. 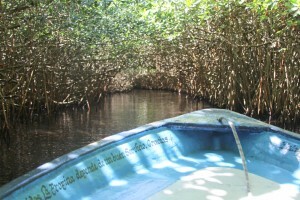 Mangroves formed a shaded tunnel through which the boat would sometimes barely fit. We eyed the trees warily for dangling snakes as the boat wormed its way through the narrow passage. We read Boa Constrictors hang from the trees here, but we didn’t see any that day. We did see too many turtles to count, many fascinating birds, beautiful lilies, and even a couple orange butterflies harassing turtles by landing on their noses over and over as the turtle tried to get away by withdrawing into its shell. San Blas is a special place, and now that I’ve had the full experience maybe I can see the benefit of all those horrible jejenes. Otherwise, San Blas would be full of resorts, tourists, and KFCs. The authentic feeling would be lost. Our guidebook called the jenene “nature’s guardian”. Nature chose an effective guardian for San Blas, and that tiny creature has effectively repelled most tourists from its gorgeous beaches. Good job, jejenes!